Whether you are moving an office of 15 or 1,500 across the states or across the world, our long distance office movers will make sure it is planned, managed, and executed efficiently. 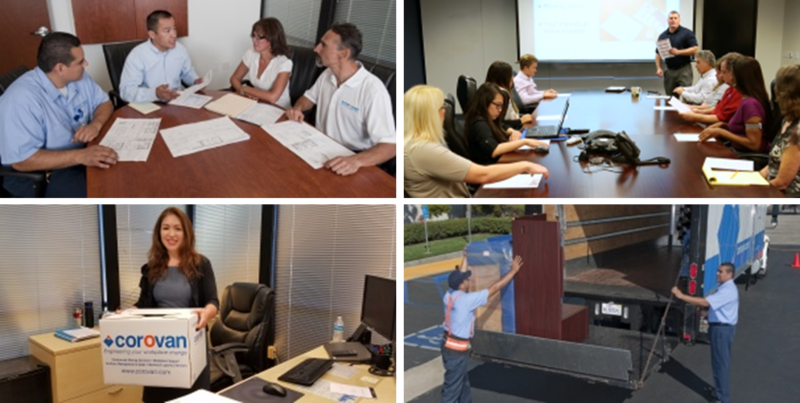 With over 65 years in the industry, Corovan Logistics brings the experience and expertise to ensure a safe and seamless office relocation for you and your team. We specialize in office moves and average over 50,000 moves per year so leave your office move planning and management to us. We’ll work with you to employ a detailed office moving process that troubleshoots every issue and avoids the pitfalls that can cause problems, delays, losses, and damages. Your business is unique, so is your move. Our long distance office movers have the flexibility to work with you to achieve your expectations. The right move plan makes a big difference in the success of your office moving cost and timeline. Our office moving experts work with you to customize a plan to address your needs, provide safety and packing instructions for your end users to ensure a safe and seamless move. Whether you are moving a small office or multiple buildings to another state, you’ll have great peace of mind knowing our account manager is there to help you manage the logistics of the move, making sure your office move is properly planned and executed seamlessly. We provide one point of contact for all communication including progress updates. … [Corovan Logistics] was always on board with our urgent requests, guided us through your process, attended our calls, gave input in terms of potential approaches for escalation, solved several mysteries for us, and in the end, set up, coordinated, and delivered a one day express shipment to our [personnel] saving us costs, time, energy, and work days off the timeline … Thanks to Denise’s cooperation and support, we shipped, funded the project, racked-stacked-powered up the servers, ran fiber, network connectivity, and even had [vendor] re-configure the machines … saved us a minimum of 5-7 work days off the timeline …. Ready to make the right move?Talk to our long distance office moving experts to get a free quote today!